Which is your current craving? I noticed that bucket bags will be a huge trend this fall and I also like them so much! Those are gorgeous! Both colours are great and I'd love to have even one of them in my closet! They are tempting and classy indeed! Oh, I can't wait to see the cheapest alternative! Maybe H&M? I haven't done shopping for a long time. So, camel cardigan and a bucket bag are on my wishlist for this fall for sure. And this is thanks to you, Lilli! Mi piace questo sacchetto!!! Lo preferirei rosso!!!! Ciao Lilli. Come ti comprendo...mi piace molto questa borsa. Forse la versione in rosso è quella che preferisco. They are beautiful bags. Very spacious too. I like that it has long shoulder straps so you can carry it across the body. Go get one. I think the red will look fabulous on you. I think this model of bags is perfect when I need much space for my things :) I like both colors! By the why your older look was ideal for weekend, happy monday Lilli! Mi piace molto questa borsa! Un bacione. I love bucket bags and already got two but right now I am craving for the entire Emilio Pucci SS15 collection. hmmmm a girl can dream! Lilli sono davvero favolose queste bag....! come darti torto? mi aggrego alla tua ossessione! i AM ALSO lusting after that bag. bag the one I used when I was in college. awesome bags! look solo comfy! Lo so è uno dei trend dell anno ma a me proprio non fa impazzire...lo trovo troppo anni '80 .. The type is like my striped navy style bag I have, I love them simples as well. Gorgeous bags!I like the red one but it must be so expensive! The bucket bags are my favorite! !IHope you will get one soon!! Dear Lilli, maybe you remember i´m in love with bucket bags too. So many designer has one in their selection. 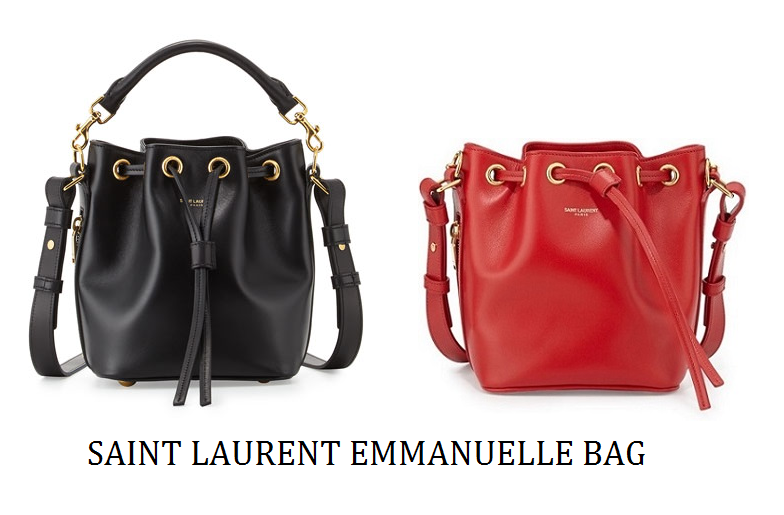 A little bit cheaper as Saint Laurent is Mansur Gavriel, but even expensive. If you find a cheaper alternative, pleas let me know. I´m not sure what color i would prefer, black or red. 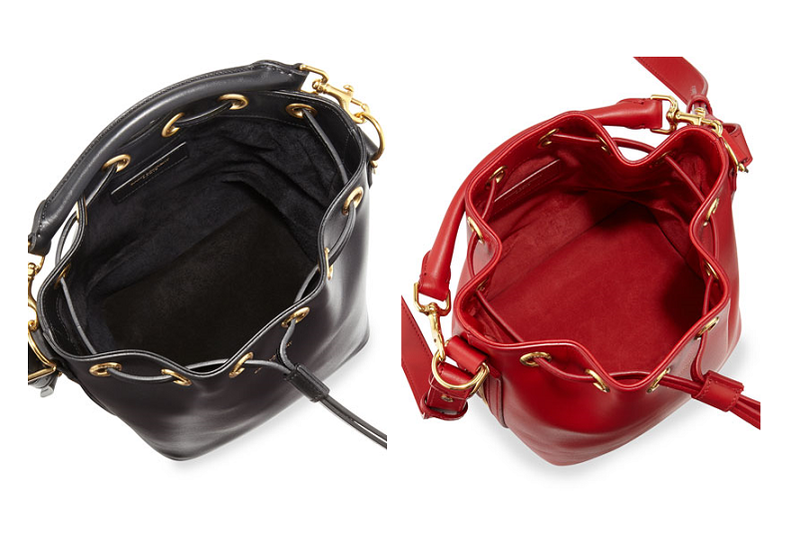 A bucket bag is such a classic bag silhouette, I can totally see why you are craving this one Lilli! The shape and size are just perfect especially in the small size and you are right that it is just so effortlessly chic and posh. I will you will get to fulfill this craving :) Have a wonderful week dear friend! Loving the new look of your page! I like this design a lot! Actually, I have ordered a similar one and I've been waiting for it for many weeks! perfection exists! love the black one, wish i had one! Uffa lilli questa non l'avevo ancora vista e vivevo tanto bene....GRAZIE!!! Almost all my bags are black, so I would love to get the red one. Great choice! Entrambe le borse sono bellissime... quella rossa poi è veramente favolosa!!! ...mi piace...la sceglierei nera...non amo molto il rosso!!! E' carinissima, mi piace molto sia nera che rossa! Sono sicura che presto saremo invase da tante versioni low cost! I'm not a big fan of bag but these are gorgeous! I like this black especially! I've been admiring the bucket bag style which seems to be everywhere this season and I agree with you that this Saint Laurent one is perfect in every way - black in particular! You may remember from one of my blog posts that I'm obsessed with gorgeous bags and I really shouldn't buy any more. I'm looking forward to finding out which alternatives you find. Have a great week! ciao Lilli questa forma di borsa mi catapulta negli anni '80!! non èil mio tipo di borsa preferita ma direi che sono senz'altro delle borse di classe!! attendiamo la versione per le nostre misere tanche!! I'm obsessed with this bag as well! perfect! Love the bucket bags - they look like they can hold a lot too. Happy October and thanks for all you share. LOVE the Saint Laurent bag Lilli!!!!! Hope you had a great day!!!!!!! Lilli can I start with how much I love the new look! Pow! And OMG I too am LUSTING after this bucket bag. It's simple but still so chic and lovely. I'll take 1 in black thanks!